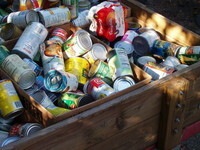 Family Support uses canned goods and other food items donated by Mobile area groups and organizations and, along with purchased items, provides food assistance. Families caring for a member who is disabled often have difficulty making ends meet and this critical assistance is very much needed. Efforts peak in the fall around Thanksgiving and Christmas, but nutritional needs are addressed year round. Kristina Polizzi, a frequent volunteer, helps put together bags of donated food for individuals and families. Students from St. Paul's in Mobile prepare to deliver carefully assembled boxes of food for families. The use of volunteers helps greatly magnify the amount and kinds of assistance that can be provided by Family Support.